Plan a beautiful destination wedding at Whispering Oaks Ranch! 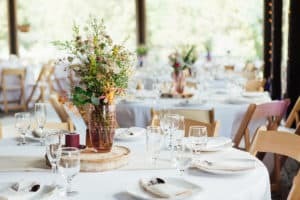 Whispering Oaks Ranch hosted its first wedding in the summer of 2005, and every year since we have continued to make additions and improvements to our beautiful facilities, providing an elegant, yet relaxing setting for the perfect destination wedding! The typical wedding season at Whispering Oaks runs from late May thru mid October. 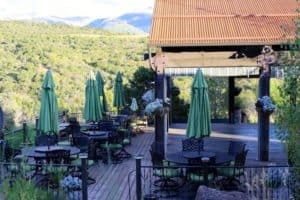 At 8,000 ft elevation, our location provides an ideal outdoor, summer wedding with central access to a number of outdoor activities. 7 Luxurious Cabins, accommodating 45-65 guests. A 55,000 sq ft lawn on our 50-acre private mountain property offering gorgeous views of the La Sal Mountain Peaks. 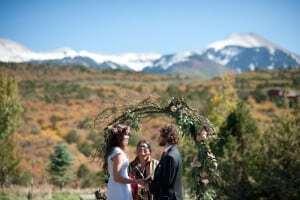 Whispering Oaks Ranch is truly a unique Moab wedding venue. We’d be delighted to work with you in hosting your ideal wedding celebration… thanks for stopping by and congratulations!